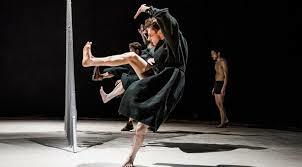 Saw Scottish Dance Theatre this evening at the Teatro Julio Castillo, performing Miann, a rather primeval 50-minute piece with eight dancers and four live musicians. It was a kind of chamber Rite of Spring, performed on a big circular sundial with a glass bead 'waterfall' in the middle and a patch of grass at 3 o'clock. Miann is a Gaelic word meaning "the ardent desire to know God", or perhaps a god. Certainly the piece reeks of earthy, pagan mysticism and I liked most of it, especially the parts when it was in full choreographic flow. At the back were four musicians, The One Ensemble, playing cello, woodwind, electric guitar and drums. Sort of Peatbog Fairies meets The Velvet Underground meets Univers Zero. I liked them a lot. (Actually the Peatbog Fairies will be playing in the venue next door in three weeks time, but that's another story).